Driving in Italy is the best way to explore its lesser known regions and beautiful towns. 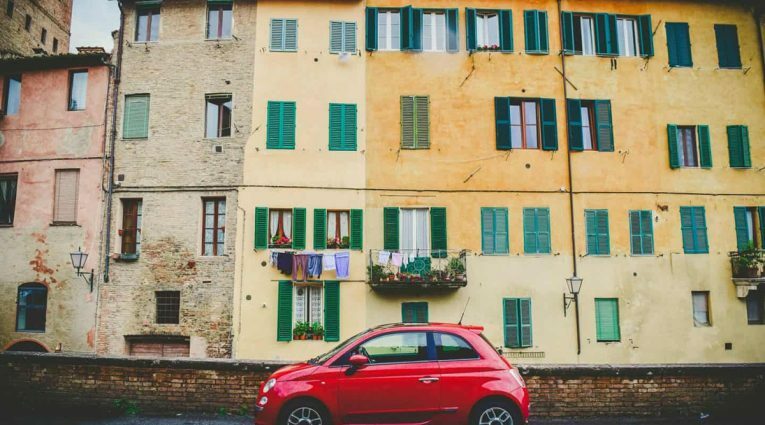 If you are thinking about driving or renting a car in Italy, here are some insights based on years of experience and thousands of kilometres! Italian drivers are fast, aggressive and skilful. Lane hopping and late braking are the norm. Don’t expect people to slow down for you or let you out. Rather, seize the moment. As soon as you see a gap, go for it. Italians expect the unexpected and react swiftly, so whatever you do, do it decisively. Much driving etiquette is dictated by unwritten rules. Flashing, for example, can “Get out of the way”, but if an approaching car flashes you, it’s warning you that there’s a police check ahead. Similarly, the car horn can mean everything, from “Watch out” to “Ciao” to “The traffic light’s just turned green”. When driving in cities watch out for traffic restrictions. Many city centres are off-limits to unauthorised traffic and if you slip into a ZTL (“Zona a Traffico Limitato”) you risk being caught on camera and fined. City driving also involves dealing with one-way systems, scooters appearing out of nowhere and narrow streets. To escape the mayhem, drive in the early afternoon when traffic is at its lightest and parking is easier. Parking is a major headache. Car parks do exist but they usually fill up quickly, leaving you to park on the streets. If you park between blue lines make sure to get a ticket from the nearest meter and display it on your dashboard. Note, however, that charges don’t apply overnight, typically between 8pm and 8am. You’ll find filling stations all over but smaller ones tend to close between 1pm and 3.30pm and on Sunday afternoons. Note that many have self-service (fai da te) pumps that you can use any time. Simply insert a bank note into the payment machine and press the number of the pump you want. Remembering, of course, to distinguish between “benzina” (petrol) and “gasolio” (diesel). Apart from your driving licence, car documents, insurance papers and reflective safety vest, which you’re legally obliged to carry, it’s worth having some coins for parking meters. Also, if you’re travelling with kids, keep some plastic bags to hand. Car sickness is a real possibility on winding country roads! Hiring a car in Italy is easy enough – agencies are widespread and all the usual rules and regulations apply. But bear in mind that a car is generally more hassle than it’s worth in cities, so only hire one for the time you’ll be out on the open road. Also, think about what kind of car to get. Rural road surfaces are not always the best and many agriturismi and beaches lie at the end of long, axle-busting tracks. Similarly, road signs can be iffy in remote areas, so consider paying for sat nav. Great advice! “ Remembering, of course, to distinguish between “benzina” (petrol) and “gasolio” (diesel).”.